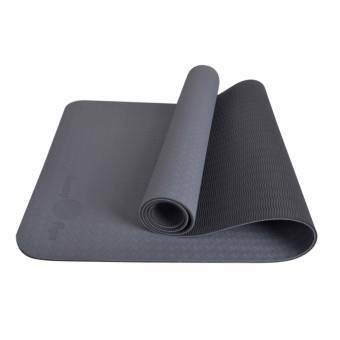 Our Eco-Flex yoga mats are made from a patented TPE (Thermal Plastic Elastomer) foam. 100% free from latex, PVC, and toxic materials like mercury and lead, the material is recyclable, making it the leading earth-conscious choice for yoga practitioners. Tested for hundreds of hours by yoga instructors and yoga students, the Eco-Flex’s unique, dual patterned surfaces provide superb traction to help achieve a grounded feeling in your postures without slipping. The closed-cell surface structure creates a strong cushion bond, preventing the mat from bottoming out, allowing you a comfortable and well-controlled practice. The closed-cell surface structure prevents the mats from absorbing sweat and saliva, making it easy wipe down and keep clean. This material’s natural characteristics help to prevent bacteria and fungal growth.